Only Toyota Genuine Parts are designed and engineered specifically for your Toyota Vehicle. 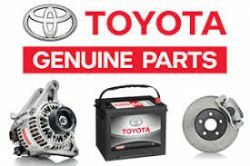 We exclusively deal in Toyota and Daihatsu Genuine Parts available at very competitive price bearing after sale warranty. Very competitive prices comparable with the market. 6-months exclusive warranty on specific parts sold by us and installed at our workshop. Large collection of accessories for Toyota & Daihatsu vehicles. Facility to arrange any special part on demand. Deals in Toyota Genuine Motor Oil, which is tailor made for Toyota & Daihatsu vehicles, is also suitable and recommended forother comparable brands. Maintaining and enhancing the power, performance and look of your Toyota is what were all about. Servicing and repairing your vehicle with genuine Toyota Parts is the only way to assure quality and precise fit. Our entire inventory system is computerized and is managed by a team of professionals who have long- standing experience in inventory control. Well- trained Salesmen and experienced staff assist customers in making their transactions enjoyable and comfortable. To enable our Service Department’s smooth functioning we have Parts counters inside the workshop also. Frequent delivery of parts ensures highest level of customer satisfaction.